After I check fitment with my neck and I have the money I will then pick up one of these. Not sure if I should even be doing this, I've been trying to move this guitar for about a year now and haven't taken it out of the case in months. But I'm thinking a bit of a refresher with a finish that isn't all cracked and a pickguard that isn't all warped might be all it needs for me to love it again. Just got a reply back from the seller of those pickguards on amazon. He can do a 3-ply black (with white engraved letters) for the same price! I think I'll wait for the body to get here first to see if I like how my warped white guard looks first tho. Ok so even though I'm the only one who cares about this I'll keep this updated. Body arrived today. The neck pocket will have to be sanded ever so slightly for the neck to fit snug, but would rather it be tight than loose.. my warped original pickguard is really shot, but what's odd is the bridge cups seem to be slightly off...I'm hoping the seller didn't dowel and redrill them in the wrong place-he only mentioned that he dowelled the trem screws and a few of the pickguard screws. But my pickguard's so warped I'm willing to believe it just only fits the original body now somehow. Now that I see this guard on it i think i've decided to get a white guard and stain in...maybe "parchment" at least to start with. "Cream" might be too dark and consistant, think I'm going for an antiguasque vibe here. That looks cool, like a partly melted strat. And a trem on a 12 string? How does that sound? This is the original body/pickguard. I liked it but I'm not really a fan of sunburst. Also this picture really doesn't capture all the wear...many cracks, dents, scratches, nicks, chips, etc. All in unusual contrast to the neck which is absolutely pristine. 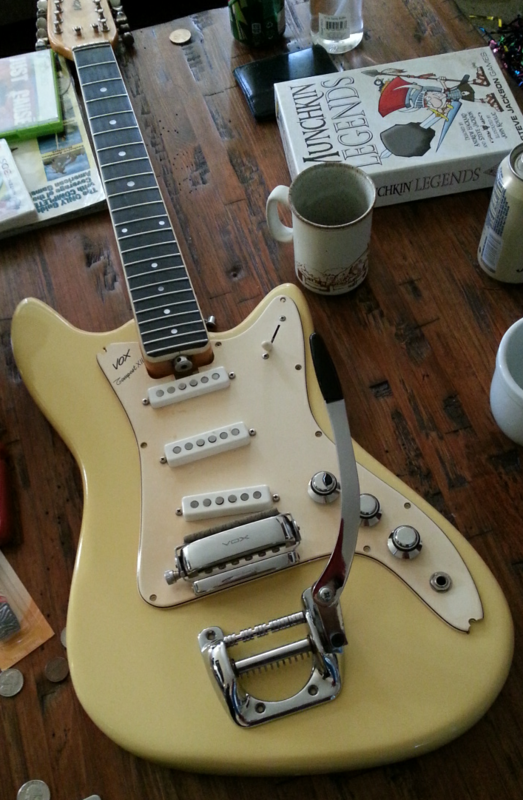 The new body was refinned in reranch vintage cream-it's a pretty good job but as with many amateur jobs, the inside of the cutaways suffered the most-it's hard to sand in those curves. It's still way better than any I've ever done personally, the front is smooth and glossy, the back could maybe use some buffing or polish but still looks nice. One thing I notice is that the nitro seems a lot more staticy than the original finish (but it feels so much nicer). I haven't decided if I'm going to try to sell off the body to help fund the new parts or just keep the original parts to add value in case I do still decide to sell down the road. Nick, the trem works really well with the 12-string, between the medal nut, bridge design and trem rollers it stays in tune better than many 6 string trems I've used. As for how it sounds, the first song/video that comes to mind is this (skip to 1:35 for a good 12 string dive bomb). The Tempest has the same neck and electronics as the teardrops and phantoms, but since nobody famous used them they sell for 1/3rd the price. Love it, dude. The NILLA WAFER and BLACK combo would be a great call. hhnnnnngggg you'd have one of those Jack White all-the-same-color rigs!!! Some stuff isn't lining up the same as on my other body. That stuff being neck screw holes and pickguard bridge post holes. I am so psyched about this project now I can't go back to original, but part of me is concerned about destroying this and ending up with an unplayable guitar. Also i discovered the truss rod in my neck is like 1mm off center, whereas the opening for it on the new body is right dead center. 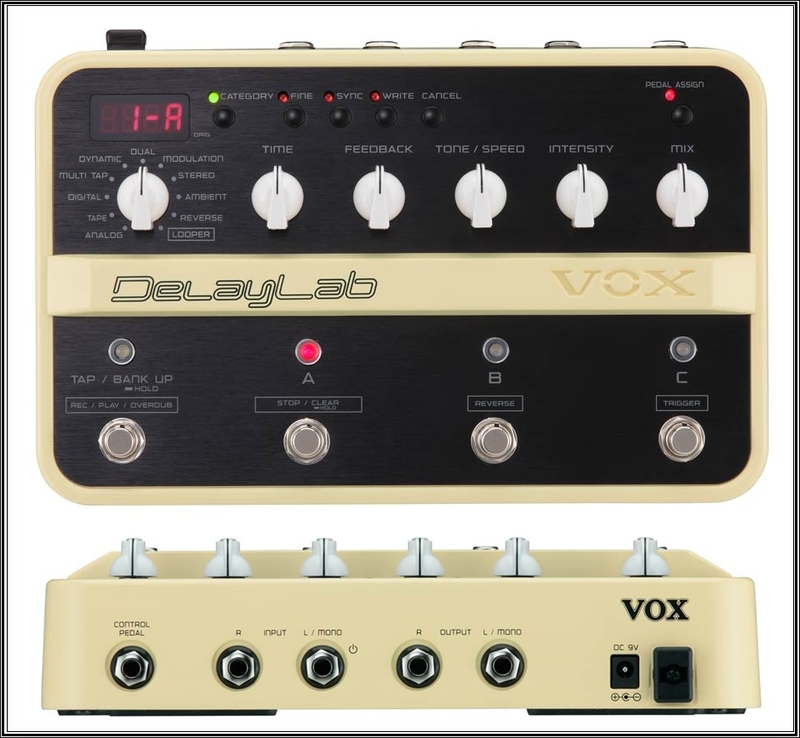 So maybe my vox was just fucked up from the factory. I feel like this sort of thing could have happened easily in the days before cnc machines. 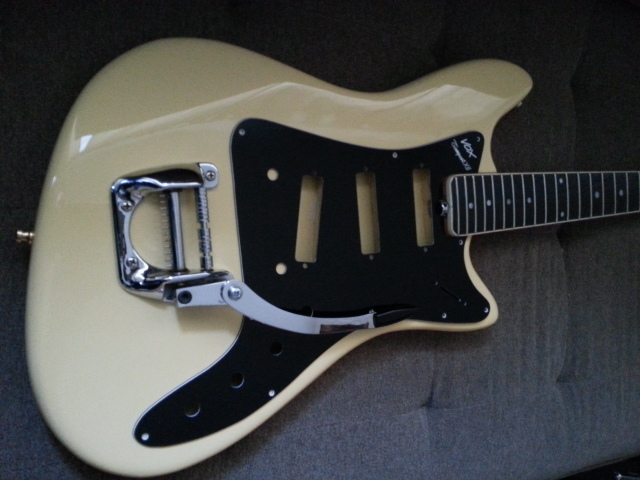 But when I order my new pickguard which body will it fit? Got a reply from the seller, who said the issues I mentioned are all things he's dealt with in the past on other vox projects with this body type. The only holes he dowelled were the trem and pickguard, because they were badly stripped apparently. I may decide to have the pickguard maker delete the bridge holes and just drill them myself to make sure they line up, unless he can send me a template to print and test fit. Got my black pickguard from Guitar Part Center in Mesa AZ. Considering the differences in both bodies I was concerned about the bridge posts...I wish now I had I actually asked for these holes to be deleted. Even with the bigass bridge on it, I will be able to see some yellow under the pickguard from the top angle. I couldn't help myself, I hate waiting. I still need to drill the correct holes for the bridge posts and put some sheilding tape around the controls. I will send the seller an email with the pics and ask if he can give me a break on the next one due to this. That looks way cool doe. I'm already planning something for the scumburst body. I think I'm going to buy a 6 string vox neck and refinish it he body OTM or Ice Blue Metallic, parchment pickguard with Jaguar pickups and a cheap bigsby type trem. Still needs a bit of a setup but feels solid and looks straight finally. Bridge should eventually be able to come down more. Oddly enough, the mute thar was always hit or miss works perfect now for some reason. It's an interesting setup. Looks great Nick. Good work. Love the color on that. Great job!